I recently popped into my local The Body Shop to have a little browse round and I spotted a display with pretty little bottles that looked like perfume. As a reformed perfume addict I really shouldn't be looking at perfume at all (I still have so many to use up!) but I wandered over to the display to have a closer look. When I got to the display I realised each of the perfumes was a different scent from taken from their products. 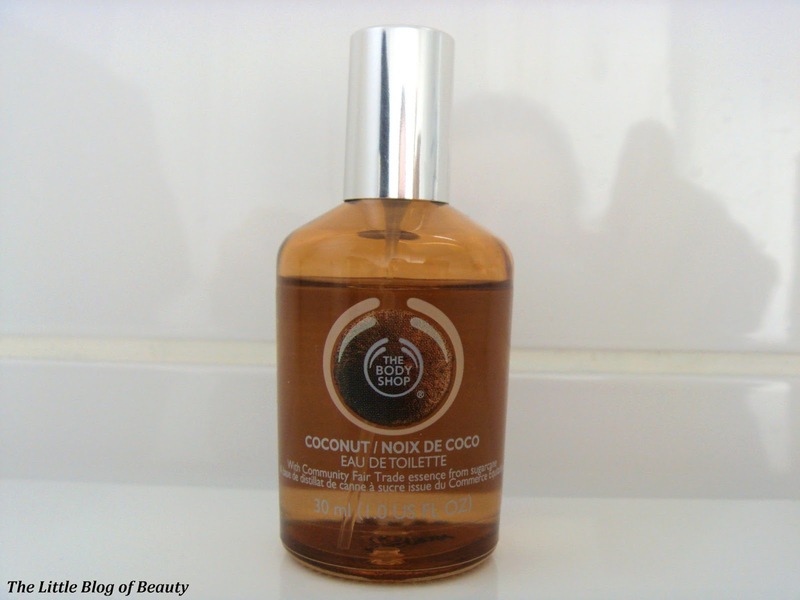 Coconut is one of my all time favourite scents so I hunted the coconut one down, sprayed some on my hand and then was very restrained and left the store! When I got home I was still thinking about this as the smell wafted up from my hand so I checked if they currently had any online offers (40% off, free delivery and a free gift, er yes please!) so I placed an order for this and the smoky plum eye palette which also caught my eye in store. This isn't what I would call a traditional coconut scent, like sun lotion (I love that smell! ), but it has a quite unusual smell that definitely does contain some coconut in there. It's not the longest lasting, I would say it lasts maybe three to four hours, although it is quite difficult to judge this as you get used to the smell of the perfume you're wearing but others may still be able to smell it. However this is such a petite sized little bottle you could easily drop this in your handbag to top up throughout the day. As I said the eau de toilette's match the scents from The Body Shops products and this is available in Chocomania, Mango, Moringa, Pink grapefruit, Satsuma, Shea, Strawberry and Vanilla. I really wish I'd tried the Chocomania one in store, as who wouldn't want to smell like chocolate, but I'm kind of glad I didn't as I'm sure I wouldn't have been able to resist buying that one too! These are just £8.50 each so you could choose three or four different scents for the same price you'd pay for a typical perfume, and don't forget The Body Shop frequently have amazing offers online and in store so it's likely you could get these for even cheaper. Which one of The Body Shop's eau de toilette's would you most like to try? 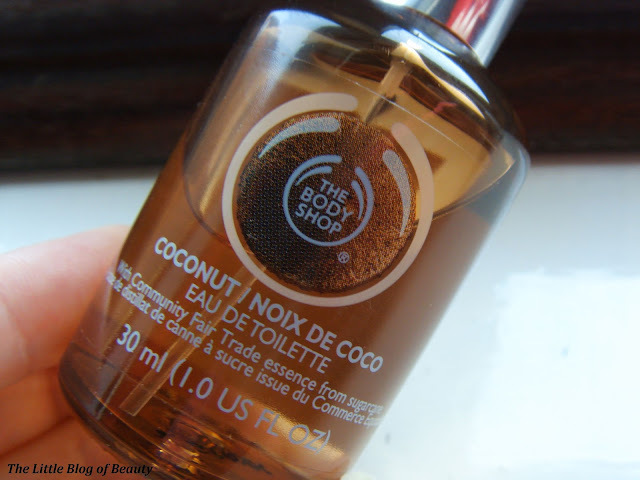 i love a natural cocont oil smell.sweet and yuum! is it smell similar? thank you!